On New Year’s Day, HSBC bank showcased their new TV advert campaign featuring a timely message of unity, diversity and the tagline ‘Together We Thrive’. While many followers praised the ad in highlighting what we have in common rather than what divides us, it was met with protest and concern. 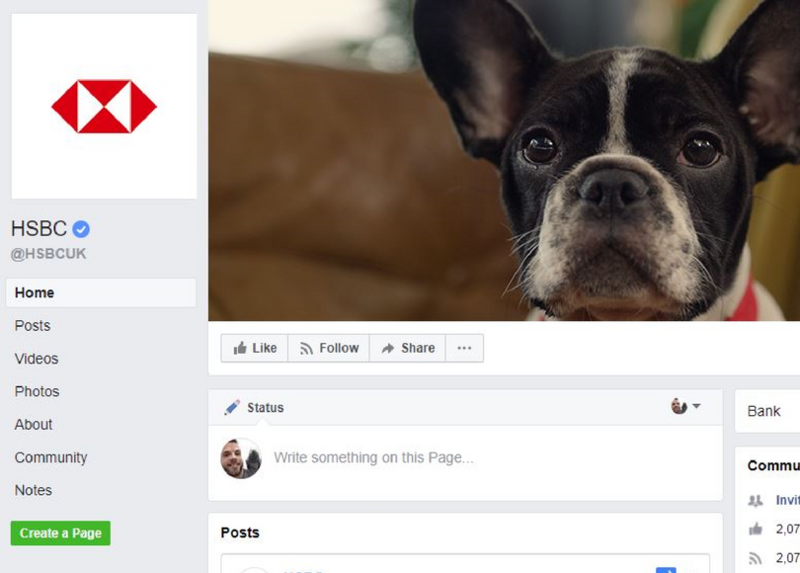 Front and centre in the ad and banner image was a bemused looking French Bulldog. And to many vets, breeders and pet owners, the ‘Frenchie’ as a breed is far from thriving. Vets and animal welfare experts suggest we’re facing a huge animal welfare crisis, with the rising popularity of brachycephalic or flat-faced dog breeds like French Bulldogs, Pugs and English Bulldogs. And here’s the clincher: advertisers are being blamed. The same backlash was seen with Heinz, Costa Coffee, Comic Relief and Halifax over the last year, all of whom used brachy breeds in their advertising and came under fire for irresponsibly cashing in on this latest trend for ‘designer dogs’. The trend of brachycephalic breeds has risen dramatically in recent years, due to their popularity across social media and celebrity culture, with brands responding to this trend and using them in their advertising. Their flattened faces, large protruding eyes and wide grins are baby-like, and our human nature and desire to nurture mean we subconsciously find them adorably cute and endearing. French Bulldogs are now the third most popular breed with 21,470 dogs registered in 2017, compared with only 692 dogs in 2007. This doesn’t take into account the many thousands not registered with the Kennel Club. They’re set to overtake Labrador Retrievers in popularity this year. Just last month, the Brachycephalic Working Group (BWG), made up of various veterinary groups, animal welfare organisations, scientists, the Kennel Club and several dog breed groups (Bulldog and Pug clubs included) called for companies to refrain from using these breeds in marketing altogether. This leaves advertisers who tend to use animals as marketing symbols under mounting pressure to do the right thing when it comes to their reputation and corporate social responsibility. As a vet who has long been passionate about animal welfare, I’m all too aware of brachy health and ethical breeding practices. I took an oath on graduation day to safeguard and champion animal welfare at all times. Working for a dog food company, I’m also mindful of not making owners feel guilty or to blame for poor welfare, when many weren’t aware of these issues before getting their dog. Lots of our customers are Frenchie, Pug and Bulldog owners after all, which is where being vocal or critical can become challenging. At tails.com, our purpose is “to improve the lives of dogs and their owners for the better”. We are a pet nutrition brand that puts dog welfare and customer satisfaction at the very heart of everything we do. Part of my role is to educate and support dog owners, whether they currently have a brachy breed or if they’re thinking of buying one. In July last year I did a piece for The Sunday Times, urging prospective owners to reconsider whether a brachy breed was for them, educating on how to choose a healthier pup from a responsible brachy breeder and persuading them to consider adopting a rescue brachy breed rather than fuelling the demand for more puppies. My advice to our marketing team has strongly recommended we only show healthy examples of these breeds in our advertising, if at all. Similarly, in our written communications and on social media we no longer refer to them as ‘cute’ or ‘adorable’ due to their physical appearance. We have always used real customers in our advertising creative and comms. Our customers love to send us photos of their dogs with their tails.com food and where these are brachy breeds, we choose to display only moderate examples without the extreme physical features that can lead to health problems. Did HSBC make a mistake? What HSBC tried to do in their TV ad was show the diversity of people and animals that make up our communities. Celebrating, as we do, real people and real dogs. A Siberian Husky, a Mexican Hairless, a Hungarian Puli and… a French Bulldog. They’ve flown in the face, almost certainly unknowingly, of the recommendations of the BWG and other vocal campaign groups to avoid using these breeds in advertising entirely. But I have to give them some credit. The Frenchie they chose is far less extreme than the majority found elsewhere, including the show ring at Crufts. He has a longer muzzle and more open nostrils compared to some of the flatter-faced examples of the breed. In fact, so unusual is this moderate Frenchie appearance that many questioned whether he was even a French Bulldog, and not a Boston Terrier or crossbreed? Can we improve the welfare of these breeds? The advert highlights the fact there are Frenchies, English Bulldogs and Pugs out there that are bred less for extreme appearance, and more for function and health. By highlighting what these breeds can also look like, there’s a benefit in promoting more responsible breeding practices. It’s these healthier version dogs we should breed from to produce healthier puppies and improve the breeds’ situation overall. Change comes creeping slowly; the breed standard that outlines the desired appearance of the dogs for breeders needs an overhaul. The Kennel Club have a major role to play here. No justification can be made for continuing to breed extreme flat faces, short backs, screw tails and excess skin that all cause significant health issues for a large number of dogs. The ability to breathe freely without obstruction, a functional muzzle and nose is surely not too much to ask for? In the meantime it’s up to brands to decide if they want to be part of the problem, or part of the solution. At the moment, the BWG advice is to stop using these breeds in advertising entirely to avoid popularising them. The hope is this may slow the massive public demand from people who don’t realise the issues these breeds face. What would we lose by choosing a popular breed of dog other than a brachycephalic breed? If we do use a brachy breed, can we choose to demonstrate to our audience the healthier examples of the breed? Can we highlight some of the issues that these breeds face, educating our audience and demonstrating our commitment to responsible advertising?